For nearly two decades, Monsanto and corporate agribusiness have exercised near-dictatorial control over American agriculture, aided and abetted by indentured politicians and regulatory agencies, supermarket chains, giant food processors, and the so-called “natural” products industry. This November, in a food fight that will largely determine the future of what we eat and what we grow, Monsanto will face its greatest challenge to date: a statewide citizens’ ballot initiative that will give Californians the opportunity to vote for their right to know whether the food they buy is contaminated with GMOs. Passage of this initiative on November 6 will radically alter the balance of power in the marketplace, enabling millions of consumers to identify – and boycott – genetically engineered foods for the first time since 1994, when Monsanto’s first unlabeled, genetically-engineered dairy drug, recombinant Bovine Growth Hormone (rBGH), was forced on the market. This is not the first time Monsanto has been challenged by citizens’ initiatives or state and local legislative efforts. But this time, the momentum is in our favor. 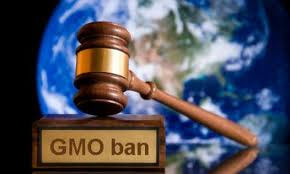 In the past, GMO “right-to-know” activists have been outmaneuvered and outgunned by Monsanto and its minions in every state, except Vermont and Connecticut, where passing a labeling bill is still, at least theoretically, a long-shot. (Monsanto recently threatened to sue the state of Vermont if legislators there pass a GMO labeling bill). OCA has learned that Vermont may not pass the GMO Labeling law now languishing in the state legislature, because Monsanto has threatened to sue the state if they pass the bill. According to informed sources, Vermont Governor Peter Schumlin is probably the only one who can save the bill from dying in this legislature session, which ends May 1. Please get on the phone right now to Governor Schumlin and tell him not to buckle under Monsanto’s biotech bullying. We need a GMO labeling bill and we need one right now. Vermont can and should lead the way! Other states will follow.